"I would like to say that these breaks are quite exceptional and can only be made on a first class table, and the table we are now playing on, is in my opinion, equal to any made in England." Sydney Morning Herald, July 16, 1907. H.W. STEVENSON, WORLD BILLIARDS CHAMPION. "The most consistent group of high performing tables seen in a major snooker event." Throughout a long and proud history HEIRON & SMITH billiard tables have been recognized for their excellent workmanship. The firm has been awarded gold medals at exhibitions in Australia, New Zealand, the United Kingdom, and the United States of America. Today HEIRON & SMITH is the most widely known billiard table manufacturer throughout NSW and a dominant influence in the Australian retail billiards industry. HEIRON & SMITH tables are installed at the Australian Houses of Parliament, Canberra, the Parliament of NSW, most of the prominent Clubs in Sydney, regional and country NSW, and in many Clubs throughout Australia. In 1988 HEIRON & SMITH joined with Alcock's of Melbourne to form the Alcock Group of Companies. Since this time, HEIRON & SMITH and Alcocks have together supplied the finest billiard tables to every state and territory of Australia. HEIRON & SMITH now operates its factory from the Sydney suburb of Mulgrave, NSW. 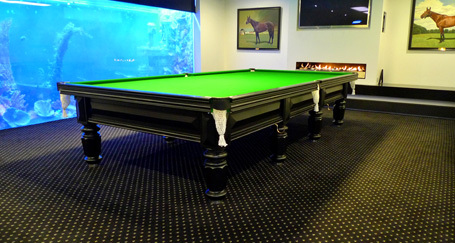 At HEIRON & SMITH we are proud that the firm continues to provide state of the art billiard tables and equipment. Our tables, bearing the distinctive brass plate, are today in use in countless homes throughout Australia and a number of countries overseas.